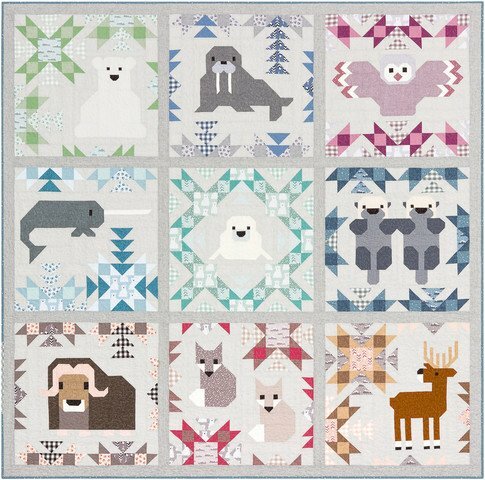 Sew up Elizabeth Hartman's latest 80" square masterpiece for yourself or someone you really love! These arctic animals will steal your heart! The 10-month program runs September through May 2019. All fabrics for the top, including binding, are included in the program price and are just as seen in her original quilt which is hanging in the shop until September 20th. Come the 2nd Friday of each month for a demo or pick up your kit any time thereafter. Each month you will receive fabric and pattern to complete a portion of the quilt. Registration price includes 1st and last months payments, $21 per month thereafter.